CENTR (Council of European National Top-Level Domain Registries) is a not-for-profit organisation of ccTLD registries. In 1998, the organisation was initially formed with a purely European focus, however membership is open to any registry today, as long as it administers a ccTLD according to ISO 3166-1. 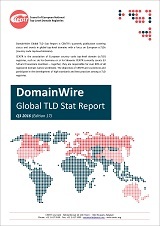 CENTR publishes quarterly reports with statistics about the global and European top-level domain market.